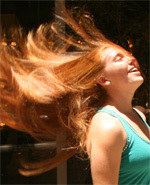 Hair extension services employ realistic looking 100% human locks to give you beautiful long hair without the wait. Extensions can be added to allow dramatic special effects and up dos which may not be possible with your natural hair length and type. Price will be given upon consultation.